LoA 9,74m Width 1,91m Depth 1,32m D=1,75t Ballastweight 1,080t Sailarea 28sqm. Tirfing/Broström owned the boat the first years. From 1954 to 1973 the owner is Curt (not Kurt) Winberg. From 1974 the boat is named Concapot and the owner is Håkan Norberg. Because the lack of appropriate name, originally GKSS-1951 and later Lotten, boat is now registered and renamed in Finland to 'Aava'. In fFinnish language, that word stands for wide open sea. Lotten is currently under restoration at Loviisa. Modified hull will remain as it is, to be able to use boat for both cruising and racing. Goal is to get her back to water in summer 2009, after four years out of water. 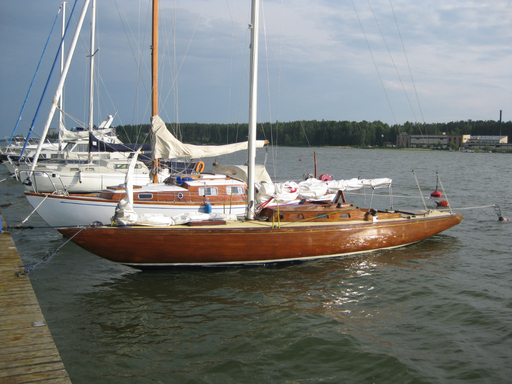 SWE 4 was built in Motala, Sweden, by Lindell at the Trickson boat yard. Arthur "Trickson" Olsson was a "big man" in Motala and he, I believe, sponsored the Lindell boat yard, hence the name Tricksons. My mistake mixing things up! This boat was the 1951 lottery boat of the GKSS in Gothenburg. Winner of the boat was company Tirfing AB, a subsidiary of the Broström group, the shipping company in Gothenburg.